I’ve gone back and forth for several days on which yarn to use. 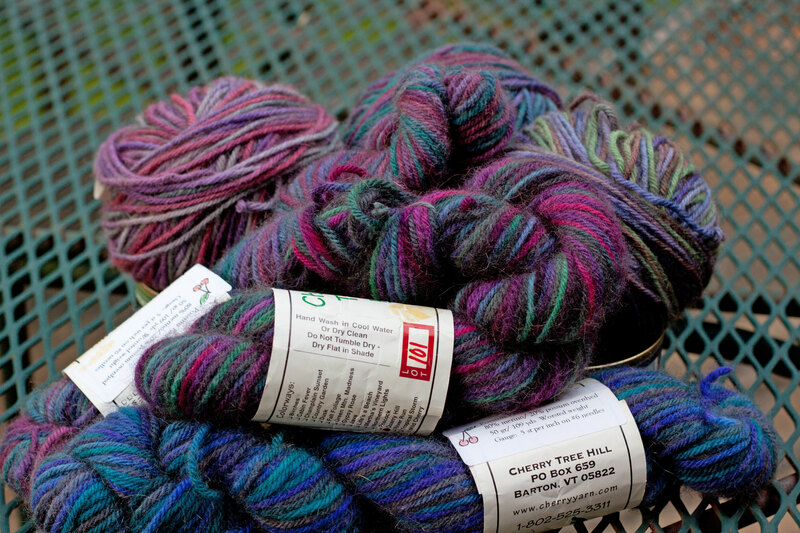 The one I would most like to use is Possum Paints from Cherry Tree Hill, but I have only 6 skeins, and all but two are in different colorways (and unfortunately, this yarn has been discontinued for so long, it’s unlikely I’ll be able to find any more). While mixing these might work, I’d rather use two of them alone, to bring out their pretty, muted shades, rather than trying to blend them in with the bolder shades of the others, so I think the Possum Paints are destined to become three or four lace scarves instead. 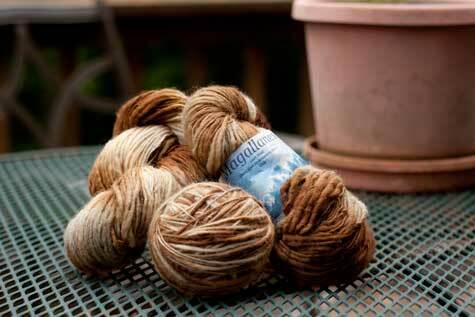 Next, I considered the Karabella Aurora 8 I have in my stash. I love this yarn, and have enough balls in each of two or three colors, so at first I thought I’d found a winner, but the way this yarn knits up, I’d rather use it for a sweater. I think it will be too heavy and stretchy for a shawl, and the dark solid colors I have will magnify every piece of lint they pick up. Since I’m planning on using this shawl as a substitute for a sweater and jacket when I travel (as well as blanket on train trips), it will be kicking around in some odd situations, and needs to look good without fuss. After this, my eyes lighted on my 10 skeins of Blue Sky Baby Alpaca — perfect! It’s lightweight, a light color that won’t show lint and cat and dog hair. Since it’s sport weight, it will be thinner and more compact for traveling, while still keeping me as warm as the thicker wool yarns would. And at 110 yards per skein, I’m sure there will be enough. But wait: this is a beautiful, elegant yarn, and shouldn’t be used for a kick-around shawl. Better for a dressy lace shawl or sweater. Keep looking. 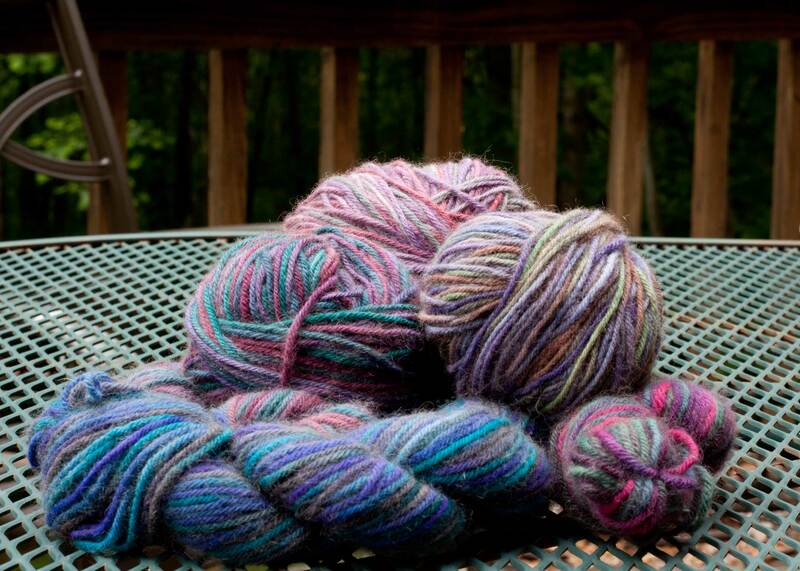 I then decided on, and rejected, Bryspun Kid-n-Ewe, Lamb’s Pride Worsted, Galway Highland Heather, and a few others before I happened to spot 3 skeins of Araucania Magallanes. It’s a thick-and-thin, and heavier than I would like, but it’s a gradient of a neutral color (beige to tan-brown), so with luck it will resist showing both dirt (dark) and critter hair (light), and each ball has 242 yards, so there should be enough if I use big-enough needles. More on the needles next time. I want a real shawl. I love delicate, lacy things, but in the winter (or in refrigerator-cold air conditioning in the summer) I want a thick, warm, working shawl. And I want it to stay on, without fussing and tugging. Therefore, I want a Faroese shawl. And I need to make it from the top down, because I have no idea whether I have enough yarn. To complicate matters, I have no instructions handy. I own Myrna Stahman’s book on constructing Faroese-shaped shawls from the neck down, but I’ve had to pack it away in a box with my other knitting books while I do some renovations. So, I thought I’d gather some info online, and then wing it. There isn’t a lot of info available, but enough. Joan Schrouder’s comments on the Ravelry forums have been especially helpful. The only Faroese-style shawl I’ve ever made was Jackie Erickson-Schweitzer’s Dolly Faroese Shawl (HeartStringsFiberArts.com). This is a delightful little project, intended to help you learn the ropes of Faroese shaping in a quick doll-size project. I highly recommend it to anyone contemplating making a full-size shawl. It gave me a basis of understanding what I’m trying to accomplish, and combining this with the information I gathered from Ravelry and other places on the internet, I hope to be able to create an approximation of a Faroese shawl. Now to decide on yarn and needles. I’m not much of a blogger. Sometimes I get so overwhelmed by life that I feel like I can’t manage to put words together coherently. But I suppose that comes with the territory: I’ve seen amazingly prolific bloggers go quiet when their lives got too hectic. So maybe I’m no worse than anybody else, I don’t know. But if things get too quiet around here, don’t say I didn’t warn you. My incentive for starting this blog is a knitting project. Whenever I start a new design, I take copious notes, usually in a spiral notebook, with a pen (remember pens? ), but I don’t take pictures of the works-in-progress. I’ve seen blog posts with progress updates, and thought it looked like a fun way to make my notes, so I’m going to give it a try. Adding pictures will be nice, too, for me to look back on later, after the thing is a complete mess and I’ve given up in despair — ahem, after I have finished my beautiful new creation and am wearing it proudly. I joined Ravelry in 2010, but never did anything with it. Then, earlier this week, I rediscovered it, and thought I’d like to try being more active on it. So, now my nascent project is listed there, but it seems that Rav doesn’t provide a place for progress updates. And so the WordPress blog is begun.